The Agora was essentially the urban heart of ancient Athens. It was the focal point of political, legal, philosophical and commercial activities, as well as an area in which important religious sites were located. Although best known for its monuments of the Classical and Hellenistic periods, evidence for human activity in the area dates back to the Late Neolithic period. It continued to be an important area in the life of the city throughout Late Antiquity, the Middle Ages, and into the Early Modern period. 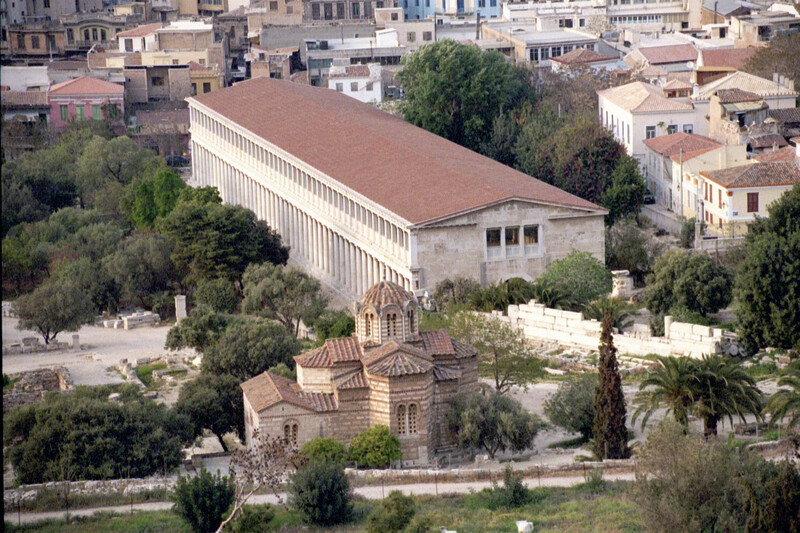 There is no doubt that the excavation conducted by the American School of Classical Studies of this important site has provided us with one of our best windows into the lives of the individuals who inhabited Athens in the past. We shall be introduced to these individuals by Dr. Stavros Paspalas, and shall also visit the newly opened gallery on the first floor of the Stoa of Attalos. PLEASE WEAR SENSIBLE WALKING SHOES TO TOUR SITES IN ATHENS. After the tour we have arranged our New Year’s lunch (with a Vassilopitta, of course) at the taverna “Oineas” (Aisopou 9, Psyrri), with its wonderful retro decor. Those of you who joined us last year will recall our very successful lunch at this same taverna and we look forward to an equally enjoyable time this year. We shall meet at the taverna, a short walk from the Agora, at 1:30–1:45. We do hope that you can join us, and partake in some post-holiday cheer. PLEASE NOTE: All those who wish to attned the tour and/or lunch should register no later then the morning of Tuesday 5 February so that our restaurant booking can be confirmed. You may pay on the day but PLEASE CALL us on 210 924 3256 to BOOK.